Volunteers young and old rolled their sleeves up to clean up a children’s paddling pool on the Headland in Hartlepool. Local councillors got involved in the tidy-up to remove piles of sand, seaweed and other rubbish that had blown in during the ‘beast from the east’ at the end of February. Around 20 helpers pitched in and over the course of a couple of hours the area was looking much cleaner. Headland and Harbour Councillor Shane Moore said: “It was basically debris from the recent storms we had. “There was quite a few tonnes of sand and seaweed all around the area. “The volunteers did an amazing job and it has all been completely cleared. Coun Moore organised the event yesterday morning in response to calls from local residents. 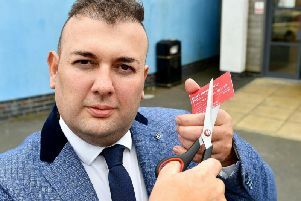 He added: “Some people were saying councillors only come out at election time and don’t do enough so it was a perfect opportunity to show that that isn’t the case and we are happy to roll our sleeves up, get out there and show a bit of social action to work with them and get the community involved. Fellow Headland and Harbour ward Councillor Tim Fleming also joined in along with childminder Sharon Howe from Little Nippers By The Sea with youngsters Willo Forbes, Emilia Littlewood and Phoebe Howe. Hartlepool, and especially the coast, took a battering during storms dubbed ‘Beast from the East’. As well as the snow, strong winds blew large amounts of sand from the beaches at the Headland and Seaton Carew. Volunteers stepped in after the council had been unable to clear the paddling pool area. Coun Moore added: “A local resident went down on Monday and saw the state of it. The paddling pool is currently not filled with water until later in the summer. Before then it needs to undergo annual maintenance including repairing the floor of the pool which gets damaged by the elements.